Start crossing cleaning projects off of your honey-do list when you consider pressure washing services from our company in Des Moines and Des Moines and Ames, Iowa. At Day Star Window Cleaning Services LLC, we work tirelessly to ensure that your home is kept in perfect condition for years to come. With our pressure washing services, our team is able to gently, but effectively remove years of built-up grime and dirt so that the integrity of your home is never compromised. As with our window cleaning services, we are proud to offer you estimates for our service by phone if you can provide us with an approximate square footage of the patio, driveway, and garage surface, as well as the pitch of your roof. We are also able to quote you prices for gutter and construction cleanup. Before our team arrives, we do ask that you remove all deck furniture so as to save time. Using a cleaning solution with our pressure washing tools, extension poles, and Little Giant™ ladder systems, we are able to tackle every nook and cranny of your building. From vinyl siding to brick surfaces to porches, we handle it all. In the event that we come across an area with extra dirt buildup, we use our special soaps. We also take the time to wet vegetation afterwards to ensure chemicals do not seep into your yard. How often should I pressure wash my siding on my house? 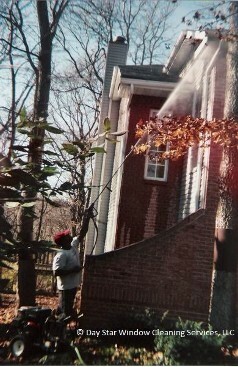 DSW recommends that you pressure wash your vinyl siding or other house surfaces once a year spring or fall. Or twice a year Spring AND Fall. What are the benefits of pressure washing my house? And the consequences of not pressure washing? Well removing mold, dirt, and spider webs that if left uncleaned can begin to breakdown the exterior surfaces of your home. 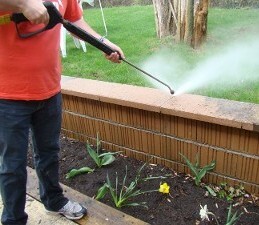 By removing that you can prevent damage to the exterior surfaces of your property. By doing this simple rather inexpensive cleaning you can maintain or increase the value of your home, and prevent added unnecessary expenses in the future. This can also be ascetically pleasing to you and your neighbors your home will look very nice and clean. Day star books many jobs over the phone and if we make any adjustments to the price it will be after we arrive and do our walk around. For full cleaning jobs we give and hour window for our technicians to arrive, we will notify the customer if there are any schedule changes. Request an estimate to make your home weather- and time-proof with our pressure washing services.